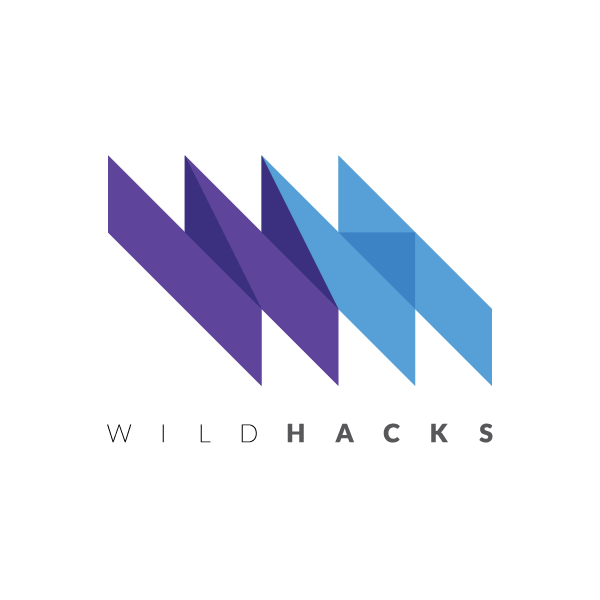 After their initial run in 2014, WildHacks decided that they were in need of a facelift. So I gave it a shot. I’ve always been interested in branding and identity design, because it attempts to tackle something that other fields of design don’t typically cover: how do I capture a sense of being? Crafting a brand from the ground up means creating a system that not is not only an accurate portrayal of the entity at the time of design, but also loose enough to evolve and change with that entity over time. It’s sort of like the Constitution, except without those boring parts about how Congress is set up and also it’s not the single most important document in United States government. That’s why I was excited when Diane, a classmate of mine, talked to me about joining the WildHacks team to help them through a facelift. Their 2014 event (which was also their inaugural event) was a huge success, with plenty of participants, sponsors, food, blood, sweat, tears, etc. But one thing they still felt was missing was a unique and memorable WildHacks identity. For one, they weren’t satisfied with their logo. It was a reflection on their parent organization, EPIC, rather than the hackathon itself, and besides that, it didn’t really reflect any of the ideas of WildHacks, or of hackathons in general. They were also looking to overhaul their website, which was little more than a generic landing page with, again, a heavy emphasis on EPIC rather than the hackathon itself. From here, we pinned down the objectives as: a) design a new logo and identity for WildHacks as a whole, which would lead to b) a theme for WildHacks 2015, and from there, c) a new website which incorporated both a) and b). To start with the logo, we listed off traits we thought we indicative of both hackathons as a whole as well as WildHacks specifically. Hackathons were innovative and fast-moving, and WildHacks in particular strived to be inclusive and unintimidating. From there, we worked with visual motifs we thought fit with those themes: flat, geometric shapes that held a modern look and feel while also giving off a playful tone (yes, we did get hung up on trying to hide an H inside of a W, why do you ask). Eventually, we settled on a sort of 2.5D interpretation of a conjoined WH, using shades of purple to represent Northwestern and shades of blue to represent the tech and hacking side. And with the logo in place, the rest of the WildHacks branding would follow suit with the logo: flat, geometric shapes with bright colors. So that took care of a). For b), we settled on a theme of construction and building, a sort of real-life counterpart to the digital things that would be built at WildHacks. We started a mood board on Pinterest and shared images that we thought captured what we were looking for. 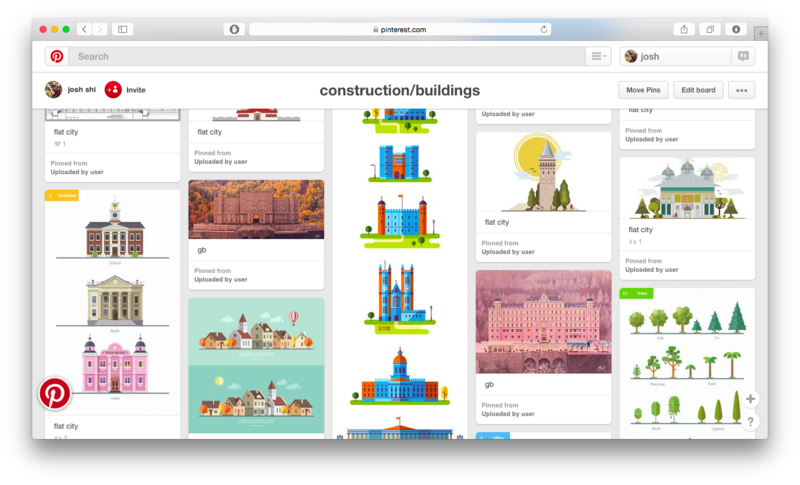 Mood boards are great tools because they help you communicate visual things very easily and ensure that everyone on the team is on the same page as far as what the look and the feel of a given project should be. From here, we also derived our main color palette: bright oranges and a variety of blues and blue-greens. 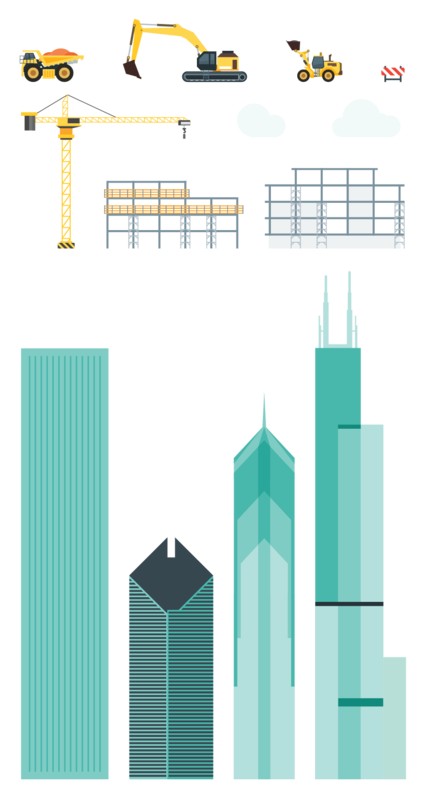 Illustrations came next, and we soon pinned down things like construction vehicles, a crane, and eventually, Chicago skyscrapers that we would use for our website. We also worked on the actual layout of the website during this time. We were looking for a way to convey the same information as quickly as the previous website had, and so stuck with a very simple and straightforward single, long-page design. Keeping with our theme, we designed the site to start in the sky and pan down over a city while the user scrolled down, eventually moving into a cutaway of the earth near the bottom. 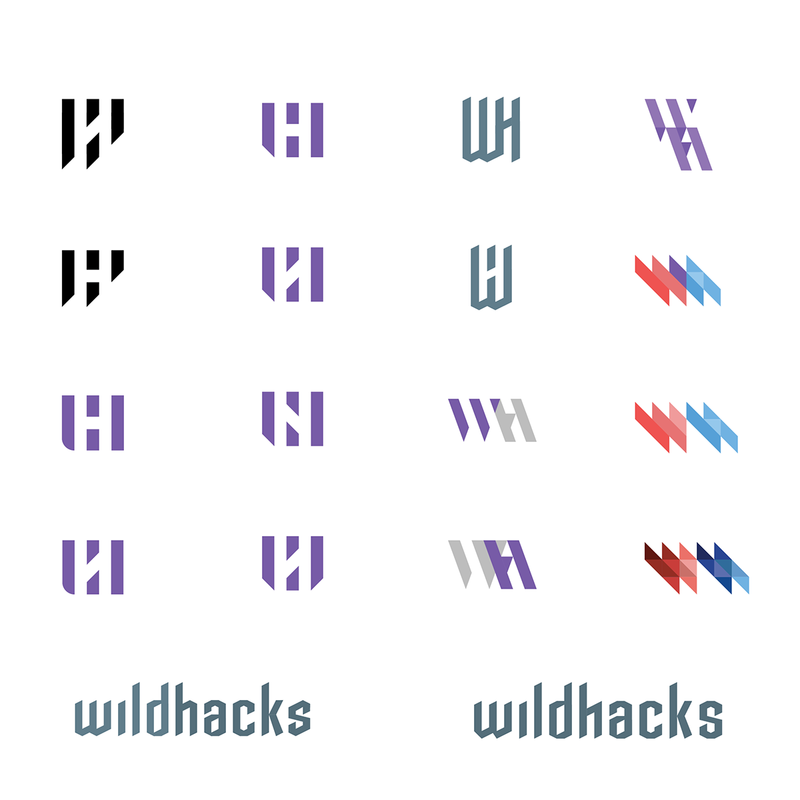 Working on the branding for WildHacks has been a great journey. It’s not every day you get the chance to really work with an organization and help develop its identity from scratch, and branding is always a fun exercise in design thinking. I should say at this point that this is the abridged version of the process, cut short only because I value your time and I don’t want you to hate me. The process of coming up with a logo took at least between April and July, and while everything else definitely didn’t take four months to complete, it definitely didn’t take a few paragraphs’ worth of time. That being said, having the opportunity to really work on the branding for WildHacks has been truly rewarding, and what’s more exciting than everything that’s already been done is thinking about everything that we’ll be able to do in the future. WildHacks 2015 is being held Nov. 21 to 22 at Northwestern University. Registrations are open here. Northwestern University’s Intercollegiate Hackathon. November 21–22, 2015.